A finalist on American Idol will be in central Iowa this week, singing in the state debut of the musical version of the Pulitzer-winning novel, "The Color Purple." 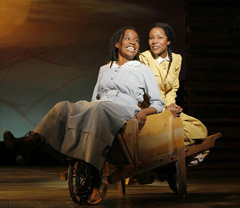 30-year-old LaToya London says the soundtrack is a moving backdrop for the story of the challenges and triumphs of two rural Georgia sisters during the first half of the 20th century. "In the movies, the music gives you that mood of what’s going on and it helps to make you cry, or it helps to make you feel frightened, if it’s a horror flick," London says. "The way they put this music around (The Color Purple) script and the different scenes, it really complements it. It’s beautiful." The Grammy-nominated score features jazz, gospel and blues, which London says is a change-up from the music she performed on Idol in 2004, but it’s not out of her element. The California native says, "I was in a community choir and we sang a cappella quartet-style stuff, we sang Latin classical, we sang all kinds of stuff, and of course, I’ve been exposed to gospel music, R-and-B music, pop and I grew up singing Maria Carey and Celine Dion." While many actors and singers go through a series of rituals before a performance, London says she’s gotten very comfortable with her character, Nettie, as she’s two years into a three-year nationwide tour with the Broadway production. "I’ve been doing it for a while now, it’s just kind of second nature," London says. "I don’t really have to prepare too much and even in the beginning, I didn’t have to. Nettie’s a pretty easy role for me. She’s just a fun-loving character who loves to have fun and she doesn’t take any mess. When something happens that she doesn’t like, she expresses that and that’s pretty much who I am." After the musical tour is over in another year, London says she’ll be ready to release her next solo album and hopes to go on a concert tour with that, while also holding out hope she can pursue film acting as well. The show opens Tuesday and runs through Sunday at the Civic Center of Greater Des Moines. For information, visit the website www.civiccenter.org .